A while back, an astute viewer (and fellow curious cat) @vlouisep tweeted a question at us. "@WhatsTheDealOK The last rain storm I saw close lightning but never heard the thunder, what's the Deal? I expected it to be real loud." So why would you see the lightning, but not hear the thunder? There are a couple of reasons, actually. The most common reason that you would not be able to hear thunder after seeing lighting is just that the lightning happened too far away from you. In ideal conditions lightning can be seen as far as 100 miles away. Thunder, however, can only travel about 15 miles before it disperses. A lot of times when people see lightning but don't hear any thunder, they call it "heat lightning". From the National Lightning Safety Institute: "Thunder audibility also is influenced by humidity, wind velocity and wind sheer, temperature inversions, terrain features, clouds, etc. (Uman, 1987 and Fleagle, 1949)." Apparently, the sound waves that make thunder can be effected by the air around us. 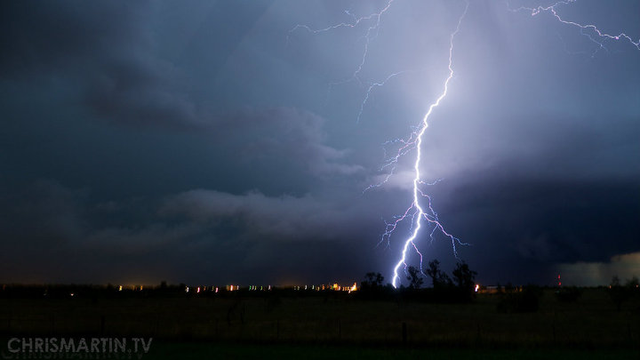 If there is a very sharp temperature differential between where the lightning strikes and where you are, it's possible that the sound wave could be dampened or deflected before it gets to you. It's the less likely option, but it's much cooler. --The science of lightning is called fulminology. -- The fear of lightning is called astraphobia. -- Lightning heats the air to around 18,000 degrees Fahrenheit. -- The place where lightning occurs most often is near the small village of Kifuka in the mountains of the eastern Democratic Republic of the Congo.